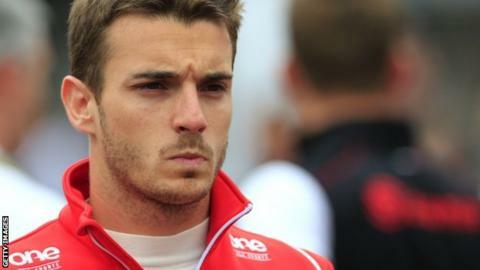 Marussia driver Jules Bianchi has undergone surgery after suffering a severe head injury in a crash at the Japanese Grand Prix. Earlier, governing body the FIA said the Frenchman would be operated on before being moved to intensive care. The 25-year-old was unconscious when he was taken to hospital from Suzuka. Bianchi was injured after hitting a recovery vehicle, prompting the stoppage of the rain-affected race in Suzuka after 44 laps. Earlier reports in the French media said Bianchi was breathing on his own following surgery. However there are now conflicting accounts. BBC Sport is seeking clarification on his condition. Bianchi lost control close to where Sauber driver Adrian Sutil had spun and hit the tyre barrier. As a recovery vehicle was lifting Sutil's car, Bianchi travelled across the run-off area and hit the back of the tractor. Mercedes driver Lewis Hamilton won the race ahead of team-mate Nico Rosberg, but said: "It is obviously a real anti-climax to hear one of our colleagues is seriously injured. That is the main worry." BBC F1 chief analyst Eddie Jordan said: "He [Bianchi] is hugely popular. "This boy was part of the Ferrari academy - he is loved and embraced by all of the drivers, not just the ones at the back where he has been in recent times, but the drivers at the front. "Fernando Alonso, Nico Rosberg, Lewis Hamilton, you saw absolutely everybody quite upset about the accident that had occurred." Having been taken by ambulance from the circuit to nearby Mie General Hospital, CT scans revealed Bianchi had a severe head injury. The race had earlier started under safety car conditions after a heavy downpour on Sunday morning as storms that preceded the approaching typhoon Phanfone hit Suzuka. The FIA issued a statement alongside Marussia confirming more details about the crash. "On lap 42 Adrian Sutil lost control of his car, spun and hit the tyre barrier outside of turn seven," it read. "The marshals displayed double-waved yellow flags before the corner to warn drivers of the incident. "A recovery vehicle was dispatched in order to lift the car and take it to a place of safety behind the guardrail. While this was being done, the driver of car 17, Jules Bianchi, lost control of (his) car, travelled across the run-off area and hit the back of the tractor. "Once the marshals reported that the driver was injured, medical teams were dispatched and the safety car was deployed. These were followed by an extrication team and an ambulance." Bianchi, who is in his second season in Formula 1, was born into a family of racing drivers. His grandfather Mauro was a three-times champion in the GT category while his great uncle Lucien competed in 19 grands prix from 1959-1968 and also won the 1968 Le Mans 24 Hour Race. He scored a memorable ninth place in Monaco this year, giving the back-of-the grid Marussia team their first points since their debut in 2010.